I was just in time to see a girl extract an oyster out of a treasure-chest like aquatic tank. A woman named Anna cracked open the oyster to reveal two pearls and with that, the wand’s new owner was set. 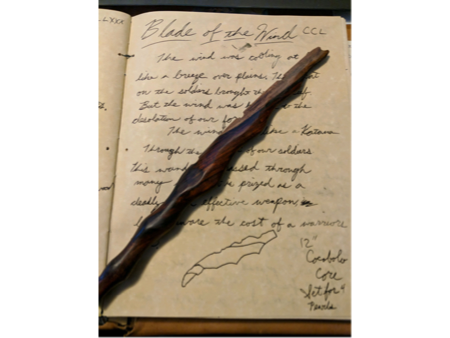 After handing the girl her new wand, The Wander excitedly flips to a page in his large leather bound book. Each page is handwritten with accompanying ink drawings by The Wander himself. 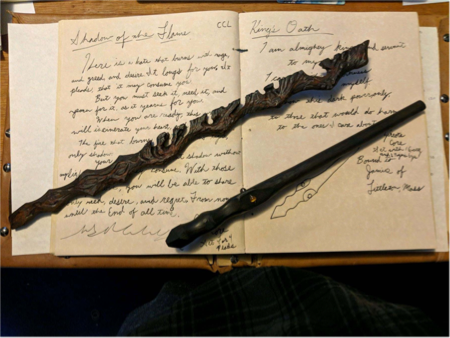 He writes down the girl’s name and explains that as he carves his wands from wood they tell him a story and become part of a greater ongoing narrative; now this girl is part of the story too. We learn that there are 6 wands that still need to be united with their masters before the completion of the first book. When the story is complete with the tales of these yet-to-be-found wizards the book will be published and shared. 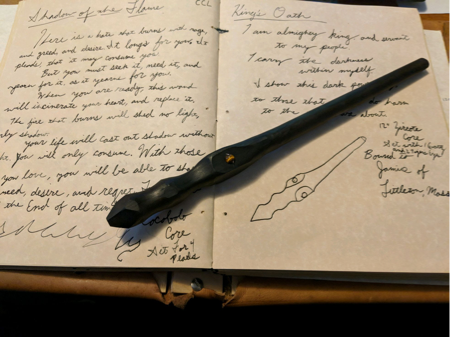 Sometimes a wand tells its story as it’s crafted, sometimes the story of a wand comes even before its creation, and sometimes a wand is crafted in response to a call from its master. However a magic wand comes into existence, it’s important that it be bonded to the right person. The Wander understands this. This is why he has carefully devised his insightful wanding process, to get to the core of what makes you unique: what kind of magic you wield. 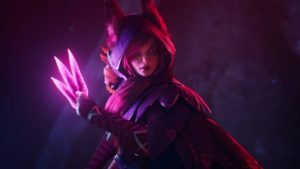 If an enemy is attacking you what would you do? What element would you use? Do you have any animal affinity? What emotion do you associate with yourself? 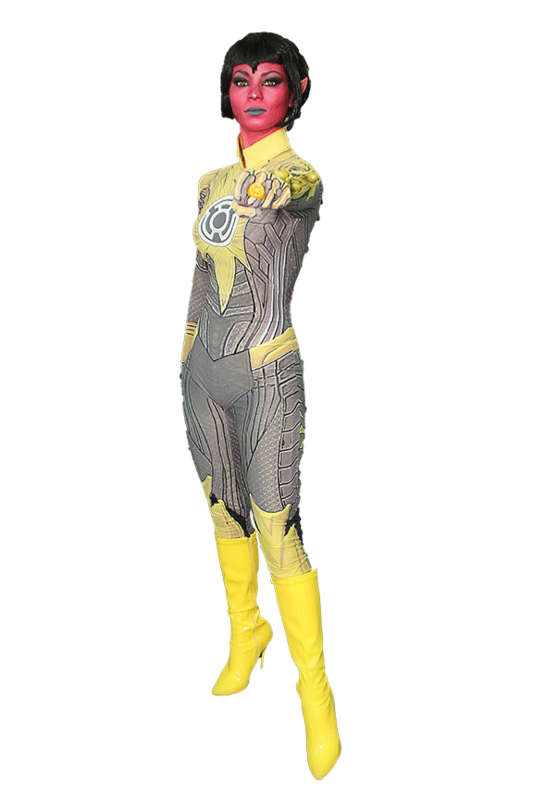 Most important: If I give you magical powers what are you going to do with them? He says, “Most people fall into the space between good and evil. This question is about seeing their response and where they place themselves on that spectrum.” Like his wands, these questions have been carefully crafted over time. And what about the pearls? If you are lucky enough to catch Wandering Wander in person, this is the final step in the wanding process. 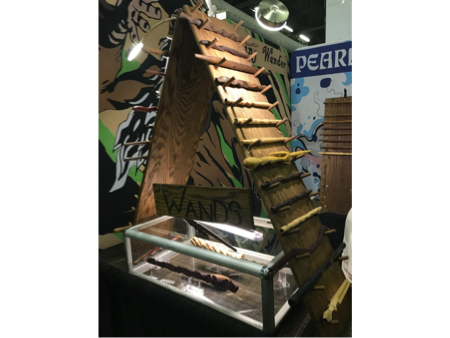 Like the girl I saw at Anime Expo, you will select an oyster and it’s pearl will be embedded into your wand – binding it to you! If you can’t make it to the Wandering Wander in person, there are two remote wanding options (the magic of lore brought to the digital age). On their site, you can request a wanding, where you will receive a handwritten letter containing the questions. You are tasked to carefully consider your responses and record them in a video for The Wander. This helps him carve the perfect wand for you. 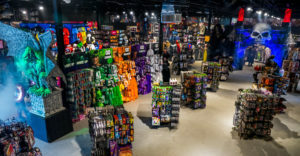 Alternatively, should your wand have already called out to you and simply needs to be brought to life, then you can select the material and even a pearl or gem for binding. He began as a jeweler, using very fine tools for very delicate and detailed designs. The Wander says working with wood was a natural progression and enables him greater creative freedom. He uses 100’s of different little carving tools, a drill press, stone grinding wheels, saws, wire wrapping, and sometimes metal with blowtorches. With some carvings being 2D and even 3D (like a dragon coming out of the wand), it’s easy to see how a wand could take up to 125 hours to create, which some do! The Wander sources exotic wood and personally selects his materials. He’s particularly fond of a type of wood called Cocobola, which comes from Central America. This wood grain is so complex and beautiful that you can make 2 wands from the same piece. Each will look totally different! It’s clear there is a great deal of love and care in each and every wand.